The family and friends of Alexander Eliot gathered on Tuesday, April 28th, at Figtree’s Cafe on the boardwalk in Venice, for a celebration of Alex’s life. The wonderful staff at the “Fig” graciously welcomed us to enjoy “the Alex” breakfast: a blueberry pancake and coffee. Alex and Jane went to the Fig every morning for breakfast for nearly 30 years, and after Jane’s death Alex continued the tradition. The cafe is a perfect place to honor him on what would have been his 96th birthday. This was not a formal service; it’s simply an occasion to commemorate the great man who meant so much to us. Video courtesy of Steven DePaola. 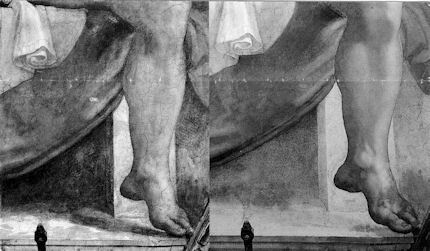 “In the landmark 1967/8 documentary, The Secret of Michelangelo, Every Man’s Dream, Alexander Eliot, painter and former art critic and editor for Time magazine states that “almost everything we saw on the barrel vault came clearly from Michelangelo’s own inspired hand. There are passages of the finest, the most delicately incisive draughtsmanship imaginable.” The film, produced by Capital Cities Broadcasting Corporation, directed by Milton Fruchtman, written by Alexander Eliot and narrated by Christopher Plummer and Zoe Caldwell, provided a brief, one hour tour of the expansive Sistine ceiling. Through the use of close-ups, audiences were presented with details of the fresco never seen before, details that were impossible to grasp at great distance. Read the full post by Gregg Chadwick here.